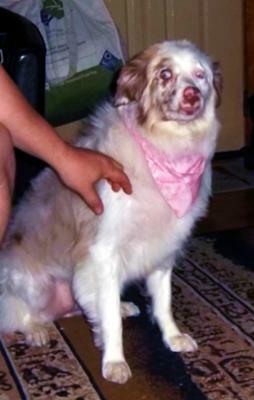 I got our pure bred Australian Shepherd from the dog pound in April. They said she was 2-3 years old but just from her behavior I didn't think she was that old. I immediately took her to my vet and although he found her very healthy he was sure she was at least a year old but that's it. We have seen new spots of color coming in on her coat, she's a Merle, and that make's me think she's under two. Does new spots of color mean anything as far as age goes? Thanks for any guidance on this, I would really like to know her age more closely. If interested the little background we know is she was dropped in a wooded area in December here in Ohio. After months of reports of a loss sheep, which one man took a shot at, the local dog pound was finally able to catch her using traps. They didn't catch her until April. She has what my vet called start point pupils and has to wear sun glasses when in the sun because they don't close quickly enough and she could suffer damage or even get cancer. She has 2 sisters, our 13 year old rescue that has been with us since 3 months old and another new addition to our family a 9 month old Chow mix. They all get along extremely well.